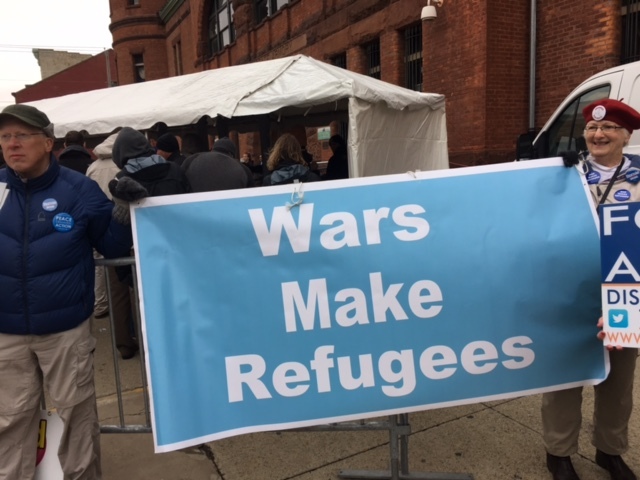 Connecting the dots between Wars and Refugees as Presidential Candidates visit the Capital District! 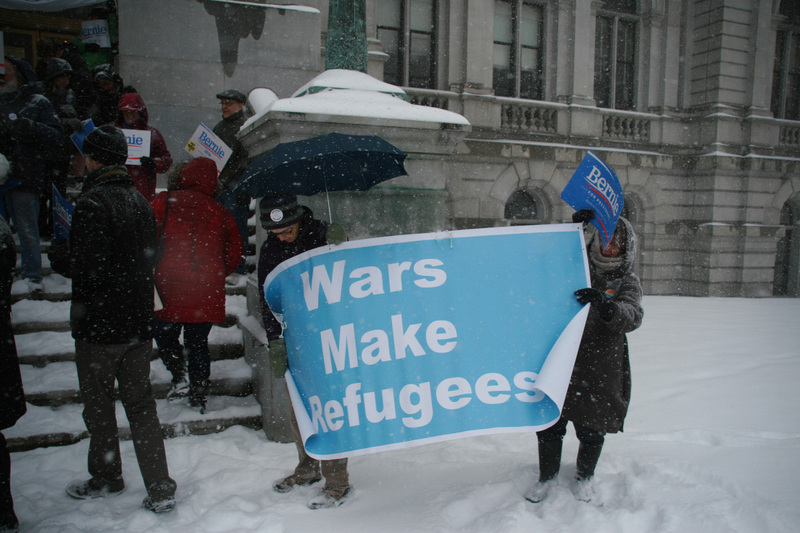 At our February meeting of the Beyond Afghanistan/No Drones Project we began planning for informational leafleting of the people who would be waiting to hear the Presidential candidates expected to come to the Capital District to campaign before the April 19th New York State primaries. Lots of enthusiasm and lots of good ideas followed. 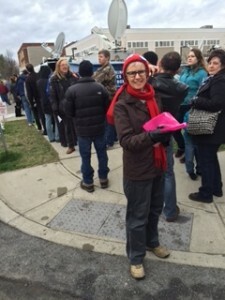 We couldn’t pass up the opportunity to reach hundreds of people who waited outside to hear the candidate(s) of their choice. 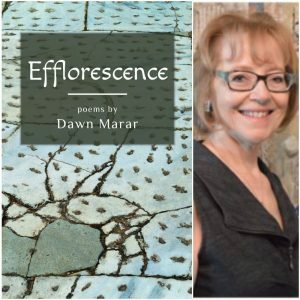 The method we chose to do this was a combination of leaflets that included questions for candidates about how they would deal with ending the wars in Syria, Iraq, Yemen and now, Libya. 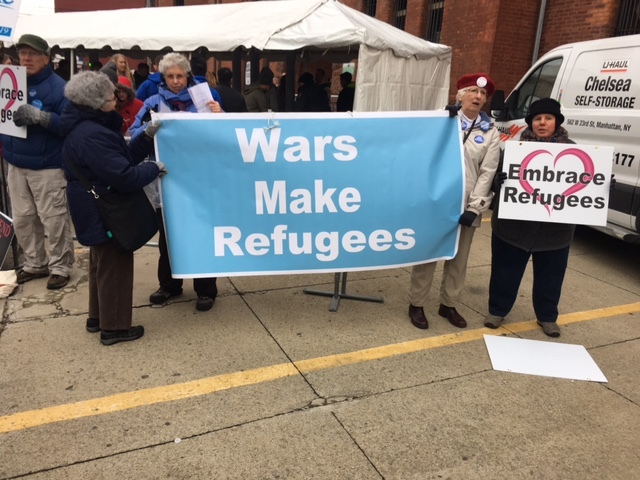 In addition to informational leafleting we held our new banner “Wars Make Refugees” and several signs welcoming refugees and opposing Islamophobia. Wars in Syria, Iraq, Yemen & now Libya, are fueled by US drone strikes, massive weapons sales to Saudi Arabia and the deployment of special forces. 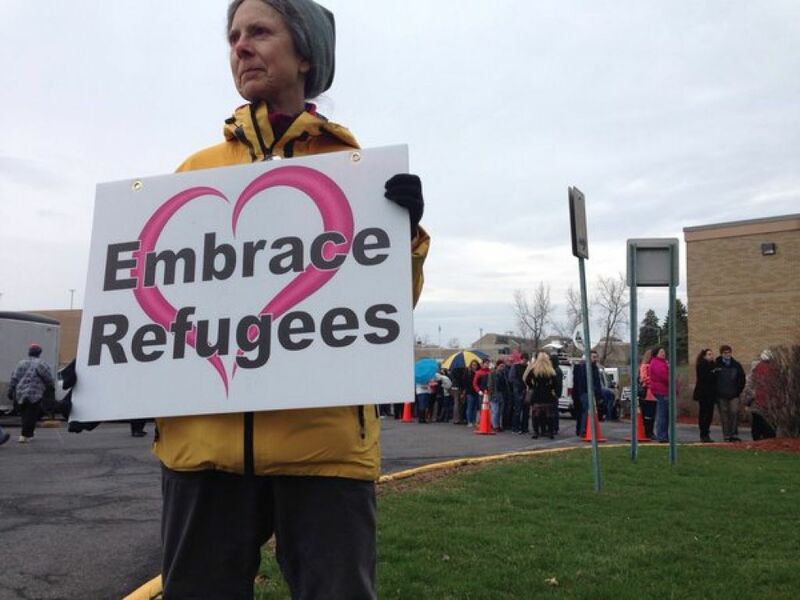 They are causing the deaths of innocent civilians, destroying communities and creating more refugees every day. 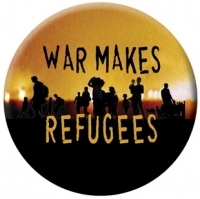 SYRIA: 9.5 million people already displaced. 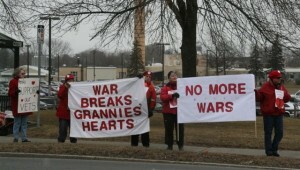 Will you support an international arms embargo, including US arms shipments? IRAQ: Over 2 million people already displaced. 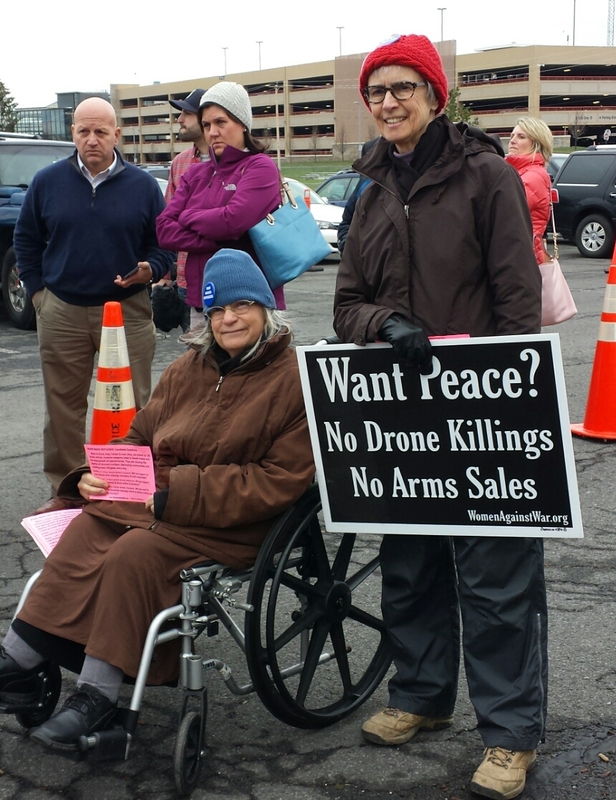 Will you support negotiations instead of drone strikes & bombing? YEMEN: 1.5 million people already displaced. Will you end US support for the Saudi-led campaign which is killing civilians and destroying the country? 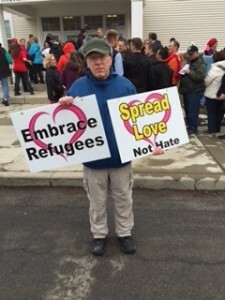 Our first round of leafleting and vigiling happened on Monday, April 4, 2016. It was complicated by an unexpected snowstorm featuring 5-6 inches of heavy, wet snow that was still falling through mid afternoon. 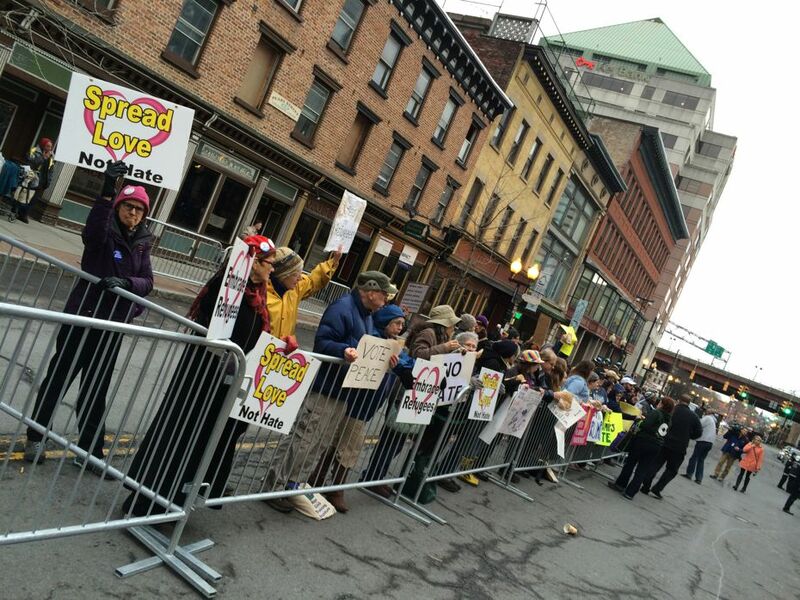 That limited the number of people who could be there but there were still stalwart leafleters and banner holders at the (Bernie less) Bernie Sanders rally at Capitol Park in Albany and the Hillary Clinton rally, at the High School in Cohoes. 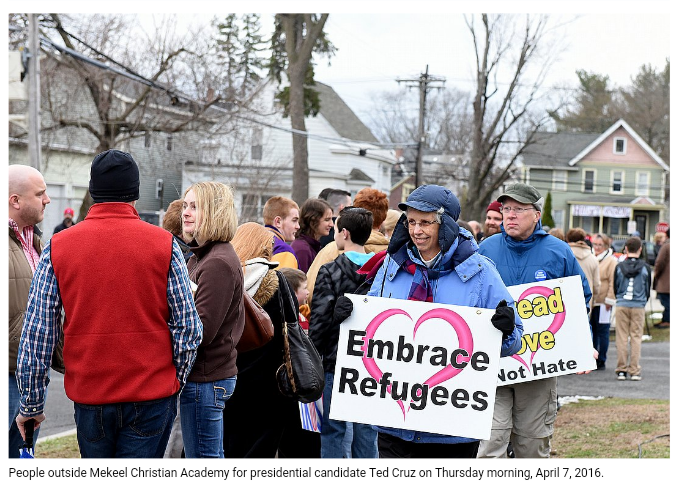 Then on Thursday, April 7th WAW members and allies were there when Ted Cruz visited Mekeel Christian Academy in Scotia. 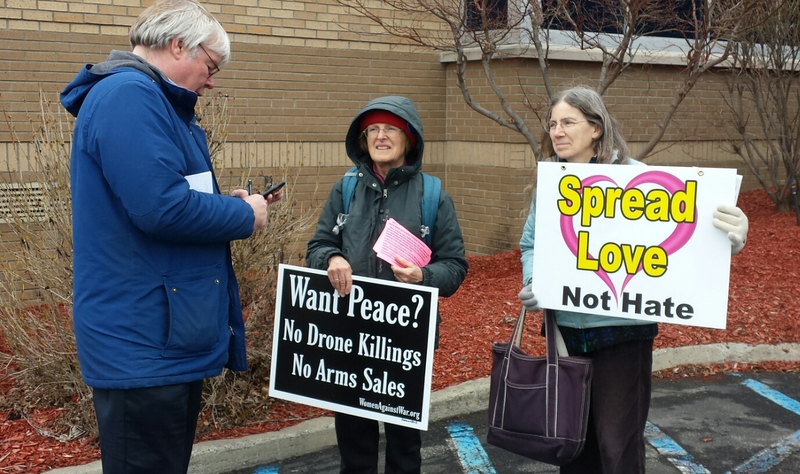 The next round of educational leafleting took place on Monday, April 11th when three of the candidates all visited Albany and Troy on the same day, but thankfully at different times and in much more hospitable weather. 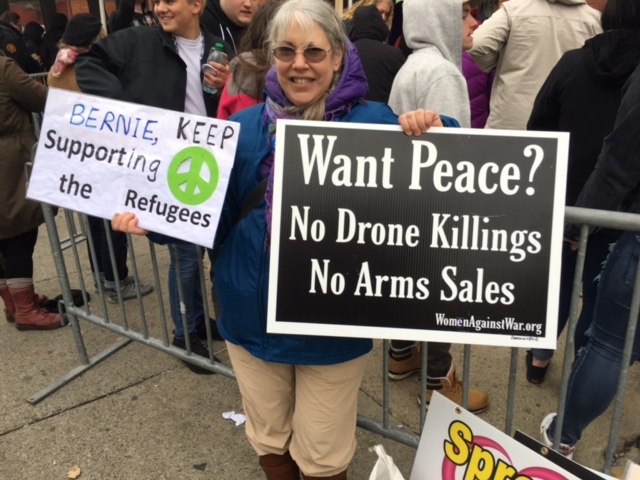 We were there for the Bernie Sanders rally during the many hours that people waited outside in long lines for his 2 PM rally at the Washington Avenue Armory, in Albany. Some of us leafleted and held our banner and signs outside the John Kasich rally at LaSalle Institute in Troy. We were in place by 1 PM and stayed until the rally began at 2:30 PM. 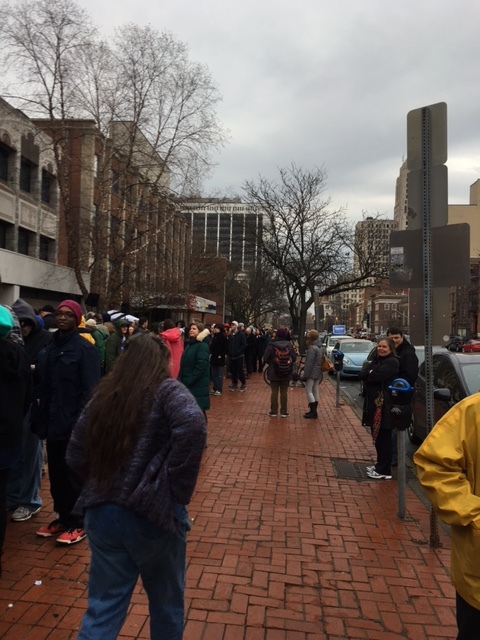 And at 4 PM we joined the very large crowd outside the Times Union Center waiting to enter and hear Donald Trump speak at 7 PM. Special kudos to Maud Easter, who took the ball and ran with it. Writing the first draft of the leaflet and above all juggling and fitting together all of the many moving parts that changed as we found out more about dates, times, locations, and special parking restrictions near the candidate venues. Thanks to all who contributed time, energy and spirit leafleting, schlepping and carrying banners and signs, documenting in words and photos, sharing information, and organizing our presence at the Bernie, Hillary, Kasich, Trump, and Cruz events.